Do you ever look at those adorable Disney-Inspired Ears online and think “I wish I could make those?” I did too until I finally decided that I would never know I could do it if I didn’t try! 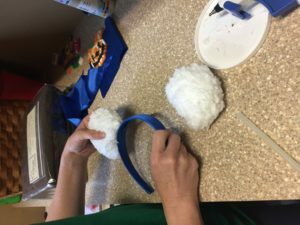 Today, I am providing you with the step-by-step guide (including pictures) of how to make your own Disney-Inspired Ears at a fraction of the cost that you can buy them online. Let’s get into it! Either find the inspiration online or walk through your local fabric store to find the material and accessories you want for your ears. 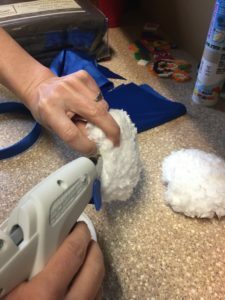 Don’t forget to also pick up 1/4″ foam sheet, poly-fill, thread for your sewing machine, headbands (you might need to purchase these from Wal-Mart), glue gun, and glue sticks. 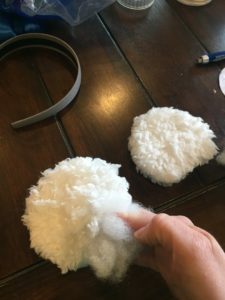 Use these outlines to help you cut out your fabric and foam: DIY Disney Ear Outline. You will need two foam cutouts and four fabric cutouts (2 for the front and 2 for the back). 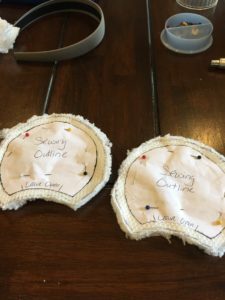 Place the front and back pieces of fabric together with the outside of the fabric on the inside (meaning place the two sides of the fabric that you want to show together). Then pin the sewing guidelines to each set of fabric cutouts. 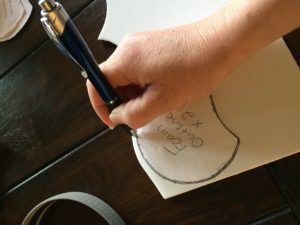 Use the sewing guidelines to sew right around the edge of the paper guide leaving the space at the bottom open. 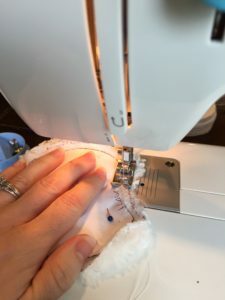 Remove the sewing guideline and pins. 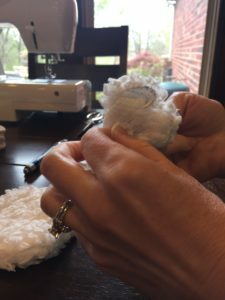 Take each sewn fabric piece and turn them inside out through the section you left open. 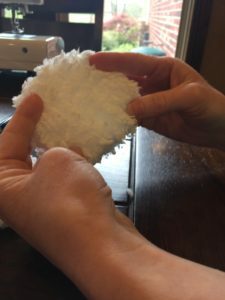 Take the foam cutouts and tightly roll them as shown below. 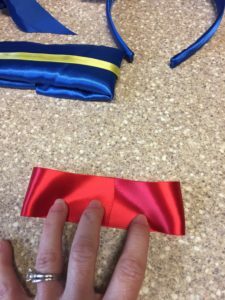 Then insert the rolled foam piece into the opening of the fabric (warning: this can be a little difficult and frustrating until you get the hang of it) and flatten it out. 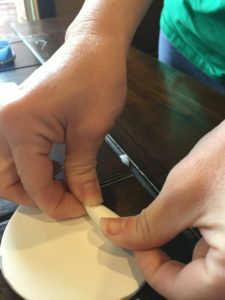 Put Poly-fill on either side of the foam cutouts to your desired puffiness. Using your glue gun, glue the opening closed. Then glue your finished ears to the headband. This is my favorite part, and it is when the ears start looking like what you have chosen to make! 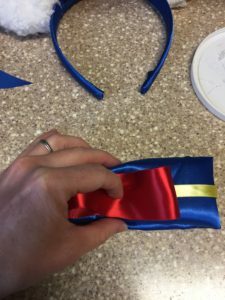 Since my example is Donald Duck Ears, I glued the sides of the fabric together and scrunched it in the middle to create a bow with added ribbon to incorporate all of the colors. 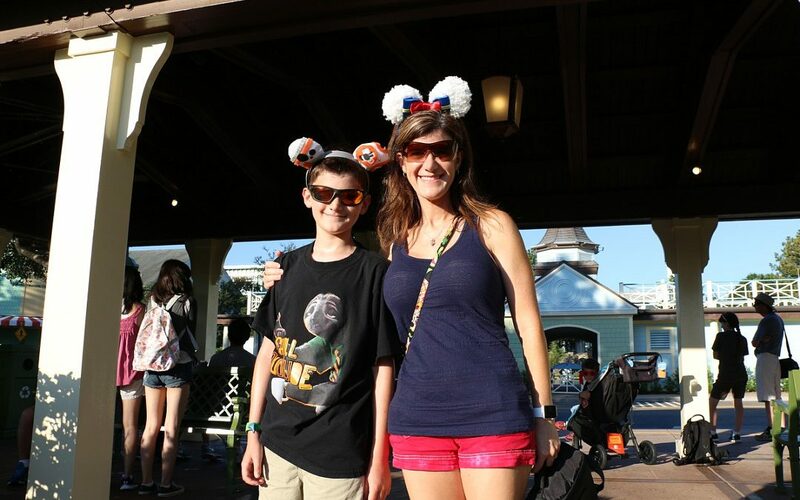 Last but not least…..Enjoy your homemade Disney-Inspired Ears! I would love to see your finished product! Please don’t hesitate to send me an email at danandleslie@addictedtothemouse.com if you need any help or advice while making your ears! I love to read! When I have the opportunity to get lost in a really good book, I soak up the chance. I am constantly looking for must-read book series especially during the summer months. That is exactly what I found with the Kingdom Keepers series! Full disclosure…..I am a huge Harry Potter fan. It took me a bit to jump on the bandwagon, but once I did, I read all 7 books in just under 3 weeks (all while working and raising a 2-year-old). Yes, there were a LOT of sleepless nights when I just couldn’t put the books down. I tell you this so that you will understand my love of young adult fiction series. One of my favorite things is to get to know the characters of a good book so well that I feel emotionally connected to them. 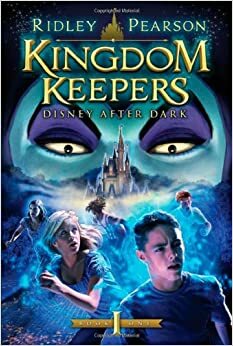 On one of our trips to Walt Disney World, I found the Kingdom Keepers series by Ridley Pearson. What could be better than a book series focused on my favorite place?!?! I bought it immediately and quickly devoured that one so that I could buy book two. The series centers around five teenagers hired by Disney to be hologram guides within the parks, but at night, the teens crossover into the parks to protect what Walt has built. They find themselves battling villains and aligning with heroes to protect the magic of Disney. Ridley Pearson has done a beautiful job of transporting you to Disney every time you crack open the cover! While reading, I can picture walking through the parks, and I often wonder if the “secret” areas that he describes really exist. You will fall in love with the characters and become immersed in the story. If you want Disney brought to your home this summer, click here to purchase Kingdom Keepers: Disney After Dark. Have you already stumbled across this series? What did you think of the books? Once you read it, I would love to hear what you think! Entirely FREE! I don’t know anything better than this reason. Someone helps you navigate everything about your vacation, and it isn’t going to cost you a penny?!?!? What’s the catch? There isn’t one. Disney offers an “Earmarked” program giving agencies the title of Authorized Disney Vacation Planners. This allows them to provide their services to you at the same cost as if you booked the vacation yourself! Considered experts in their field! 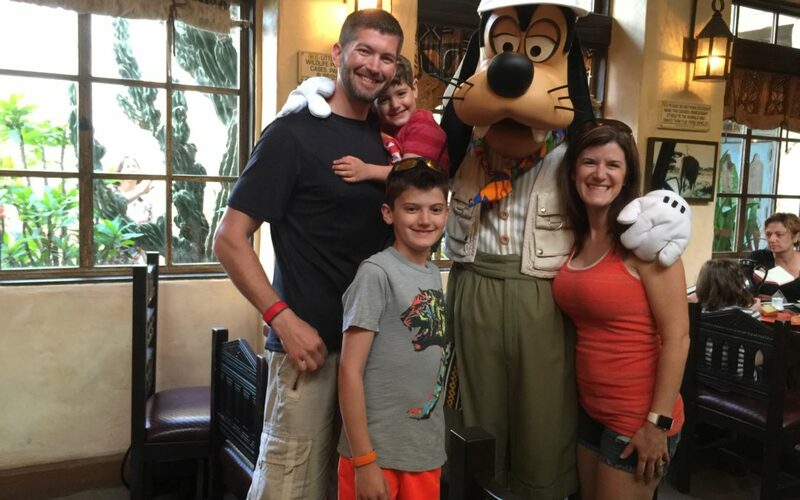 Most, if not all, Authorized Disney Vacation Planner agencies require that their agents have extensive travel experience to multiple Disney destinations prior to hiring them. In addition, the agents graduate from the College of Disney Knowledge (best college courses I have ever taken). Agents always must stay current in these courses. Because of this, expect that your agent is an expert on most things Disney. Now, we all know that no matter what field you work in, we can’t know everything. The important thing is knowing where you can find the answers and these agents do. The support that agents receive is unbelievable. If a client stumps me with a question, I have a private Facebook group with my agency. I also have an Authorized Disney Vacation Planner priority line that I can contact. On top of all of this, any agent who specializes in Disney vacations began this journey because they are passionate (some say obsessed) with all things Disney! Who better to help you plan that magical trip?!?!? Never miss out on a promotion or potential discount! Agents who specialize in Disney destinations constantly watch the promotions released by Disney. Your agent applies these to your vacation if it is available, even after you book! I always encourage my clients to book a vacation that they are comfortable with while I watch for the discounts. When Disney releases promotions, a limited number of rooms are included in the discount. Sometimes, not all categories of rooms or resorts are included in these promotions. Your agent will often look at other options for your travel party to see if you could save money by staying somewhere else. One of the best feelings as an agent is calling your client to tell them their vacation is now $400 cheaper because of a promotion you applied! Itinerary planning! From advanced dining reservations to fast passes, tons of pieces go into planning your magical vacation. You can count on your agent to do all of the research, discuss the best options for your travel party, and make all of the reservations. This includes where to stay, where to dine, and where to play. Your agent keeps track of all dates that things need to be done with your vacation. For example, Advanced Dining Reservations are available at 180 days at Disney World and 60 days at Disneyland, fast passes can be booked at 60 days when you stay onsite but at 30 days when you stay offsite (WDW), final payments, personalizing magic bands, and online check-in. Those “hard-to-get” reservations often require booking as soon as they are available, if you want a chance of doing them. This is another area where your agent can shine! With that being said, if you want to have more control over the planning, your agent can be as involved or as hands-off as you desire. I have clients that simply tell me a general budget and time of year they want to travel and want me to plan everything else. Then, I have clients who present very detailed plans and simply want me to help watch for promotions and deal with issues. Available during your vacation for any issues! Let’s face it….no matter how well planned your vacation is, things always come up that need to be addressed. Contact your agent, and they can call Disney to fix the problem or change the reservation for you. Then, you simply continue your stress-free magic while someone else handles the issues. Hopefully, this has convinced you of the huge value that a travel agent who specializes in Disney vacations provides during your magical vacation planning. 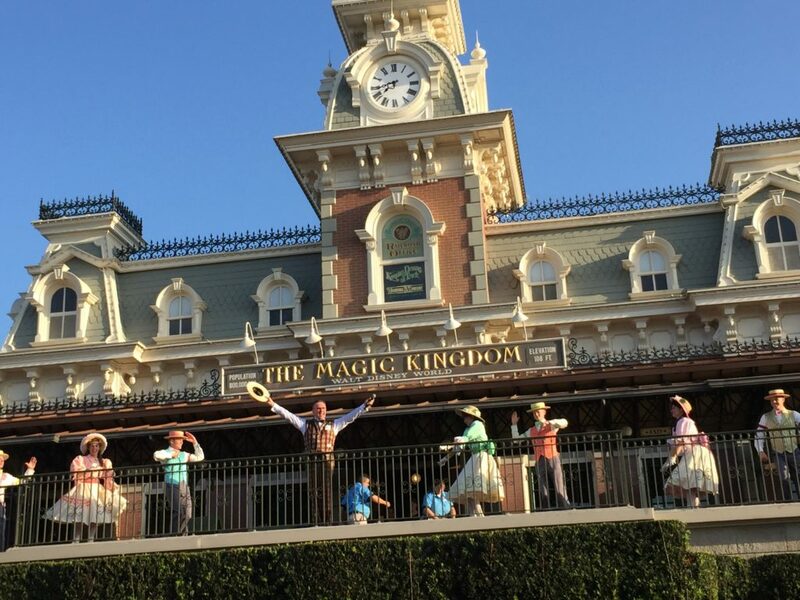 While we recommend Fairytale Journeys as our preferred Authorized Disney Vacation Planners, several wonderful agencies and agents are out there. Just make sure that you “click” with your agent and they provide you with what you need because you depend on them heavily during this process! Please contact me if you need help with your next Disney vacation. Click the above Fairytale Journeys image or email me at ftjbyleslielowry@gmail.com. Thanks for reading, and let me know what your favorite reason to use an Authorized Disney Vacation Planner! 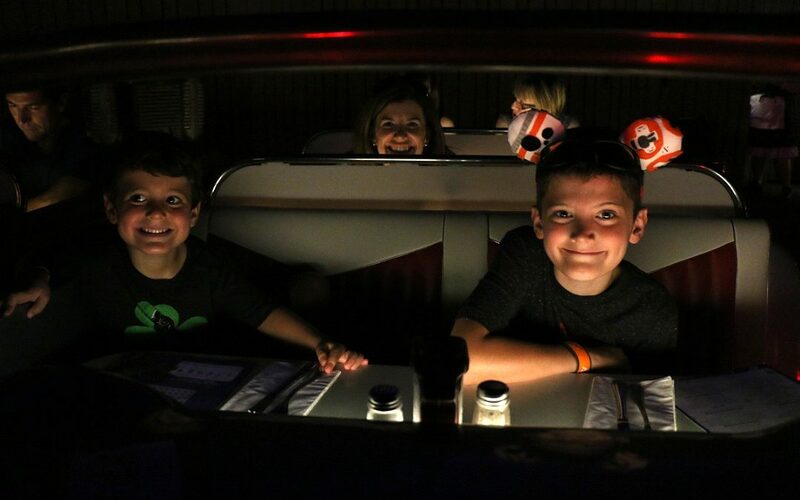 Sci-Fi Dine-In Theater: Fabulous or frightening??? We absolutely LOVE dining at Sci-Fi Dine-In Theater! This is at Hollywood Studios and a must-do for our family. We always like to find a place to relax during our park days, and it is not always feasible to go back to the hotel to kick our feet up for a bit. Sci-Fi is a great place to get out of the sun and crowds to relax somewhere dimly lit and quiet. When the cast member seats you, you enter what appears to be a 50’s style drive-in theater complete with a star-filled sky and classic cars that also serve as your booth. On the screen, there are old, campy-style scary movie clips and cartoons playing. This is why I have heard some parents say that they think it would be too scary for their kids. I wouldn’t let the scary movies prevent you from trying this place out! They are of the old black and white “scary” movies with the giant spider or oversized woman attacking the town (the kind of movies that Mystery Science Theater 3000 makes fun of). Our youngest gets frightened easily, and he thinks the movie clips are silly. Sci-Fi Dine-In Theater is considered a Table Service meal if you are using the dining plan. Even when using the dining plan, we have always paid out of pocket for this experience because we usually like to get milkshakes, beer, and a couple of appetizers. We have not ever had an actual meal there so I can’t speak for the entrees, but the fried pickles and spinach artichoke dip are amazing! Our kids have always been seated in the front seat with Dan and I in the back seat. The cast members always make a huge deal about if the kids have their drivers licenses which the boys think is hysterical. They will usually give the boys their own drivers licenses to take home with them. Along with the ambience, my favorite part about dining here is that the kids are usually so captivated by the movie clips that they don’t even want to talk. I know that makes me sound like a horrible mother, but it is nice to disconnect a little and just relax. Check it out and let me know what your thoughts are on Sci-Fi Dine-In Theater! Click the link below to watch our Sc-Fi experience from July 2016 and go to about 6 minutes! 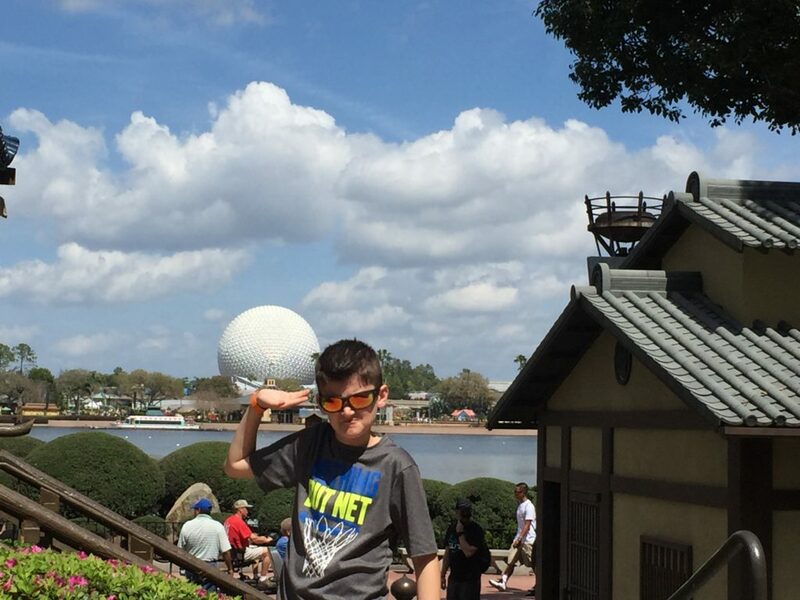 Walt Disney World is full of activities to keep your family busy from sun up until sun down. Matter of fact, we have spent roughly 1.5 months collectively in the World and still have yet to do everything. While we all want to do and see as much we can on these magical vacations, let’s face it, we aren’t as young as we used to be! I don’t know about you, but I often wonder where my children get their endless energy. With that being said, I have the perfect solution! The best kept secret at Animal Kingdom Park is The Boneyard. Our boys LOVE this area (We may love it even more)! 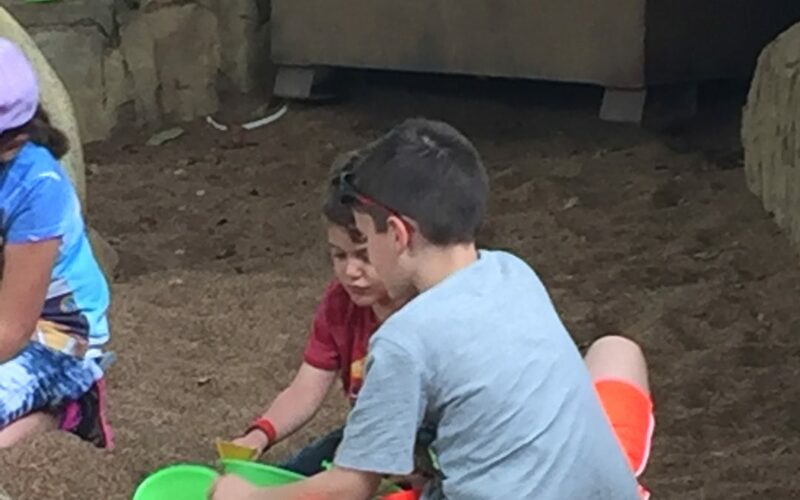 It is a giant play area with rope climbing, slides, caves, and even a large area made to look like an archaeological site where the kids can unearth dinosaur bones. The best part is that the majority of it is shaded with areas to sit! There is only one way in and out with a cast member standing duty monitoring who comes and goes. They don’t let any kids leave by themselves so you don’t have to worry about them sneaking away from you. Our boys ask to go here every time we are making our plans for Disney World. It makes the must-do list for Animal Kingdom! So, next time you are there, go ahead and take a moment to put your feet up while your children run freely and burn some of that wonderful energy….the only downfall is that they don’t let you take in beer.